We come across many blogs that claim to share details about products known to act as Kratom potentiators, and guess what they are? The usual drugs. I question them, why are we even going for Kratom in the first place if we have to go and take more drugs. Isn’t it evident that we are taking Kratom to have natural effects, and now potentiating it with drugs that can give disastrous results? This brings me to my motivation behind writing this article. I want the masses to know that it’s the natural things that can help us achieve almost any effect we want, and that synthetic and artificial products must be kept at bay. 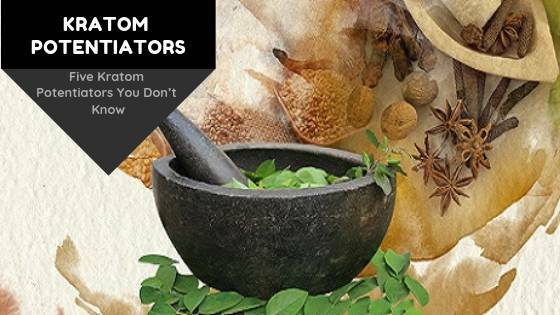 Let’s have a look at five Kratom potentiators that you don’t know. What Is A Kratom Potentiator? Anything that adds up to the effects of another substance is called a Potentiator. A Kratom potentiator is a substance that enhances the efficacy and potency of Kratom regarding improving its pharmacokinetics and pharmacodynamics. This means that the onset of action is made quicker, the duration of action is prolonged, and the excretion or metabolism of Kratom is delayed. This also means that Kratom is quickly absorbed from the GIT into the bloodstream. Why Do We Need Kratom Potentiators? So, basically, we want to get rid of a side effect of Kratom, i.e., Kratom tolerance. Kratom tolerance develops when you start taking Kratom on a daily basis and in increased doses. It is a state in which you become immune to the effects of Kratom, and you need to take increased amounts of Kratom to feel the effects of Kratom. We really don’t want this to happen to you, therefore, starting a potentiator can help you reduce the dose of Kratom and thus prevent developing tolerance. What Are The Five Best Kratom Potentiators That You Don’t Know? It is one of the most potent Kratom potentiators. It is that one juice you should continue taking for your entire life because not only it potentiates the effects of Kratom, it also improves your metabolism, enhances your defense system against infections and improves your appetite. It has powerful antioxidants that reduce the aging process. Turmeric is usually added to food items as a spice. It has some herbal activities and is known to improve the immune system, help in the healing process and protect the gastrointestinal tract from harmful bacteria. Luckily, it is also known to potentiate the effects of Kratom. How it does so? This is not known but mixing some turmeric powder with Kratom powder can actually enhance the action of Kratom. Chamomile is a widely available substance and comes in different varieties. It is used to relieve pain and to treat digestive disorders. It was known to be a remedy of skin issues, gout, arthritis, and burns. It has analgesic, anti-oxidant and anti-inflammatory properties. When taken with Kratom it can potentiate the analgesic effects of Kratom and make it stronger and more long-lasting. It adds up to the effects of Kratom since both Chamomile and Kratom are natural painkillers and relaxants. It is an herb that has beneficial properties regarding improving sleep, reducing stress and anxiety. These are the effects similar to that of Kratom. Kratom is a sedative if taken at higher doses and stimulant at lower doses. Valerian root enhances this action of Kratom by adding up to it. Other than these significant natural potentiators there are numerous other potentiators such as hot water, green tea, coffee, watercress, cat’s claw, and magnesium. When you add natural potentiators to Kratom, you do not need to fear any side effects. You know you will not overdose on them, and it won’t harm your body. They are always cheap. These substances are available at meager prices. They are available everywhere unlike other potentiators. You can easily access them in any supermarket. You do not need any prescription to buy these herbs. You can always experiment with the combination of Kratom and these herbs without the fear of producing something with ill effects. Before taking any Kratom potentiator, ensure that you have taken Kratom alone and you have experienced the effects. You shouldn’t be taking both simultaneously if you don’t know about your Kratom dosing. Measure your Kratom dose carefully and you can even slightly reduce it as these potentiators will help you achieve the desired results. If you face any side effects, immediately stop taking the potentiator as well as Kratom. Stay hydrated and avoid overindulging in Kratom and its potentiators.